Individual Stock Momentum - That Dog Won't Hunt? Dead or dying academic ideas latched on to by unwary institutional investors litter the investment graveyard landscape. 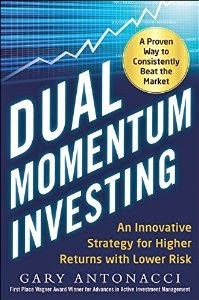 My new book, Dual Momentum Investing: An Innovative Strategy for Higher Returns with Lower Risk, describes some of these, such as portfolio insurance, small cap premium, and portfolio diversification with passive commodities. Most of these occurred because of incomplete information or omitted variables. Shortly after Rolf Banz published a paper based on his University of Chicago PhD dissertation that identified a small cap premium from 1936 through 1975, Dimensional Fund Advisors (DFA) and others quickly tried to exploit this "small cap anomaly." They learned later that this apparent anomaly was perhaps driven by a mistake in how researchers treated missing data for delisted stocks, many of which were small caps. As noted in my book, studies since then have shown that the small cap premium by itself may no longer offer above market risk-adjusted returns. Portfolio insurance was based on the elegant idea that you could synthesize protective options through a combination of stock buying and selling combined with short-term borrowing and lending. You could "insure" your portfolio using these synthetic options. 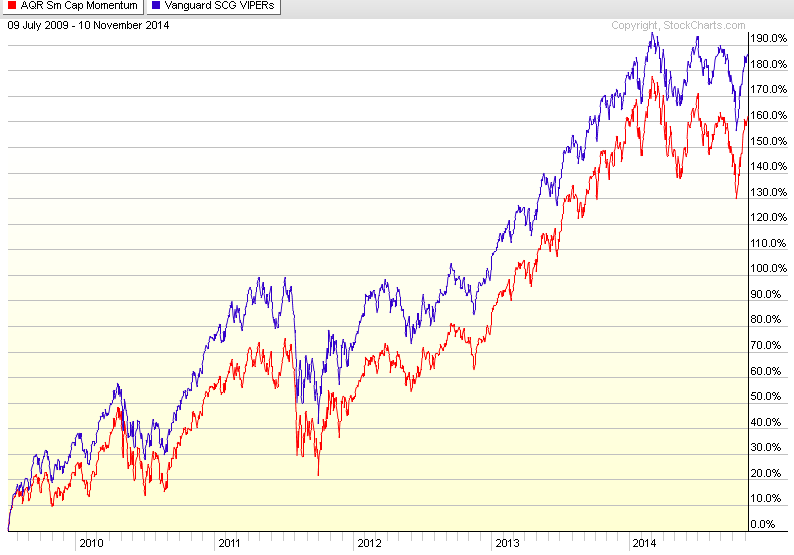 However, what portfolio insurers failed to take into account was the short- term mean reverting nature of stocks. At that time, most academics thought stocks followed a random walk and had little or no auto-correlation, even though for many years stock exchange specialists made handsome mean reversion profits by trading against public order flow. Portfolio insurers quietly packed up their bags and disappeared not long after they first appeared. In the mid-2000s, academics published studies showing that passive commodities could be a decent portfolio diversifier. Investors jumping on to that bandwagon failed to realize that very large inflows of speculative capital from institutional investors could eradicate the premium that had previously been flowing from hedgers to speculators. Front-running costs of over 3% annually from simultaneous rolling over index future contracts would also take its toll on speculative investor profits. After half a dozen years, there were new research papers showing that adding commodities to a stock/bond portfolio was no longer beneficial. It may very well be that relative strength momentum applied to individual stocks is the latest academic concept that may not work so well in practice because of investors blindly following academics without seeing the bigger picture. Many academic studies of momentum ignore transaction costs, which can be significant. A trading costs study by Frazzini et al. (2012) of AQR, covering 13 years of data in 19 developed markets, stated that "...the main anomalies to standard asset pricing models [including momentum] are robust, implementable, and sizeable." The authors were looking at long/short momentum using proprietary data over a relatively short period using broad range of large cap momentum stocks. Lesmond et al. (2004) found that momentum stocks were relatively less liquid than other stocks. They concluded that "… the magnitude of the abnormal returns associated with these trading strategies [stock momentum] creates an illusion of profit opportunity when, in fact, none exists." Korajczyk and Sadka (2004) found the profit breakeven allocation to be only $2-5 billion for long-only strategies using the top 10% of momentum stocks. Transaction costs, however, are only half the story. Academic researchers validate cross-sectional relative strength momentum by looking at winners versus losers and segmenting the stock market into deciles, quintiles, quartiles, or terciles. According to Siganos (2007), beyond the first few extreme winners and losers, there is a continuous decline of momentum gains from larger momentum portfolios. Siganos found maximum momentum returns using a portfolio limited to the 40 top and bottom performing stocks. 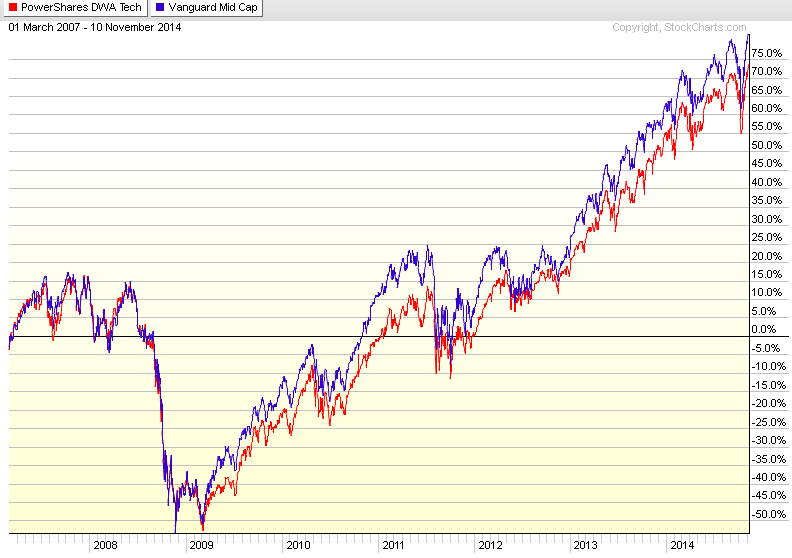 Yet all publicly available stock momentum funds so far use more than 40 stocks, and some use ten times more than that! The iShares MSCI USA Momentum Factor ETF holds 125 stocks, and the PowerShares DWA Momentum Portfolio has 100 holdings. The AQR Momentum Fund, AQR Small Cap Momentum Fund, and AQR International Momentum Fund hold 479, 953, and 440 stocks, respectively. These represent nearly 50% of the underlying indexes from which these momentum funds draw their holdings. 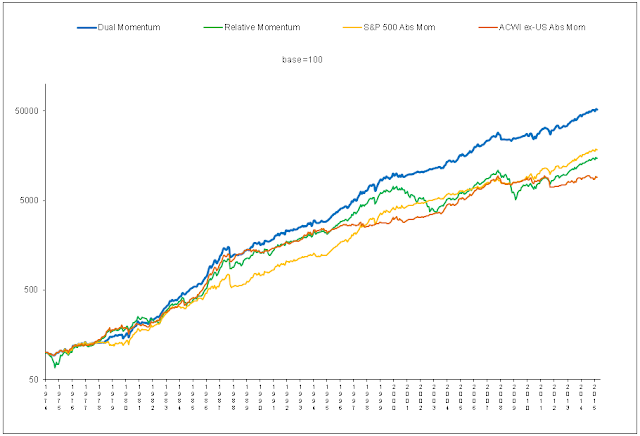 The annual expense ratios of AQR's momentum funds range from 0.50 to 0.90%. In contrast to this, you can invest in the Russell 1000 broad-based index from which AQR draws their momentum holdings for a cost of only 0.11% per year. When you add in another 0.7% per year that AQR estimates as transaction costs for their quarterly rebalanced large/midcap momentum index, it raises serious questions about how investors can really capture momentum profits from individual stocks. Yet, as they say, the proof is in the pudding. In Chapter 6 of my new book, I show readers a simple way to find style-based alternatives to so-called smart beta funds. In many cases, style-based ETFs with lower expense ratios and lower transaction costs offer similar or better performance than their "smart beta" counterparts. I thought it would be interesting to use the same technique to look at lower cost style-based alternatives to the largest and longest existing publicly available funds that use momentum applied to individual stocks. The following comparative charts using momentum funds that can be accurately matched up with stylistic index funds begin at each momentum fund's inception date using the lowest cost class of momentum shares. 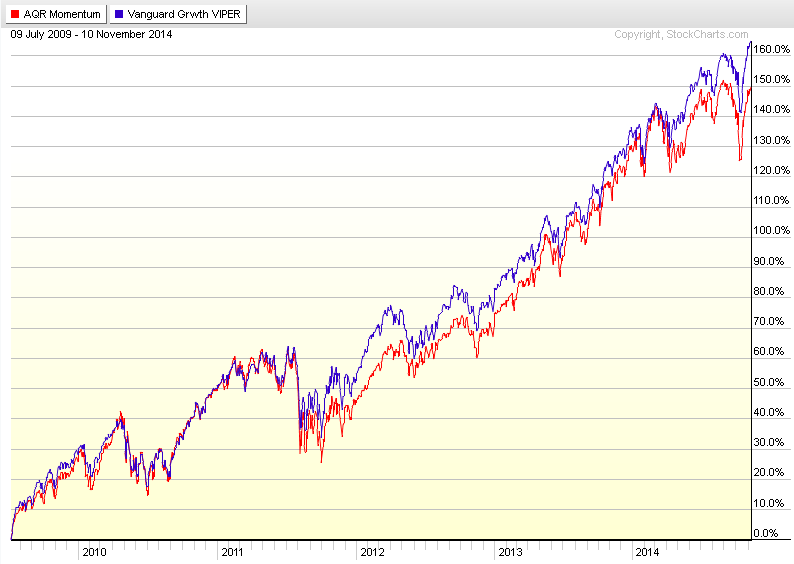 The stylistic equivalent fund to the AQR Momentum Fund (AMOMX), with an annual expense ratio of 0.40%, is the Vanguard U.S. Large Cap Growth ETF (VUG), with an expense ratio of .09%. The stylistic equivalent fund to the AQR Small Cap Momentum Fund (ASMOX), with an annual expense ratio of 0.60%, is the Vanguard U.S. Small Cap Growth ETF (VBK), with an expense ratio of .09%. The stylistic equivalent fund to the AQR International Momentum Fund (AIMOX), with an annual expense ratio of 0.55%, is the iShares MSCI EAFE Growth ETF (EFG), with an expense ratio of .40%. 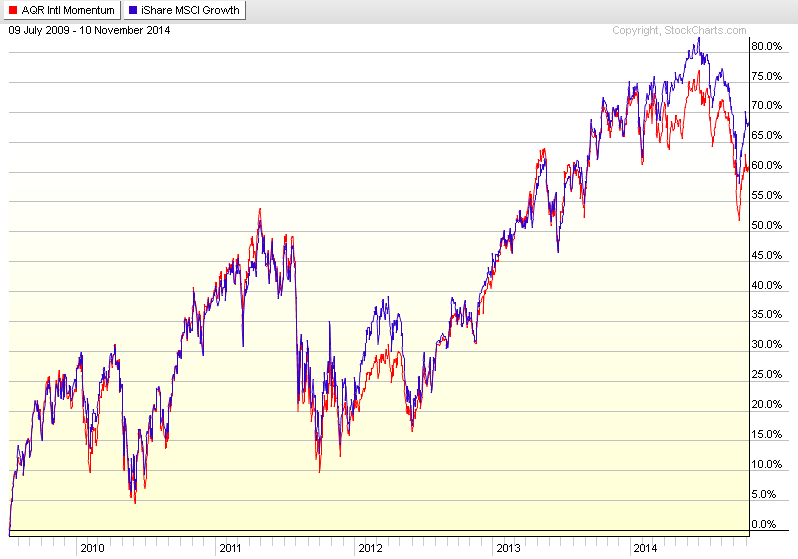 The above charts give some evidence of why I am not a fan of using momentum with individual stocks. It should also be mentioned that relative strength stock momentum does little or nothing to reduce portfolio drawdown. To accomplish that, you would need something like absolute momentum or another trend-following filter (cross asset diversification may also help somewhat). In terms of both risk and return, momentum is more effective when it is used with asset classes or broad indexes having lower transaction costs, and when it incorporates trend-following absolute momentum, as described in my book.